As the title says, I set no goals for myself this year. Not a one. So what happened? I rode farther and more often than ever before. My total mileage for the year was 8,087. I surprised myself since I had discovered that I had messed up my records in the spring and had several hundred miles more than I thought. My biggest mileage month, 919 miles, was October when I did a bunch of recreational rides during the government shutdown. My shortest month was March, 434 miles. I spent a good deal of time checking out colleges with my daughter. 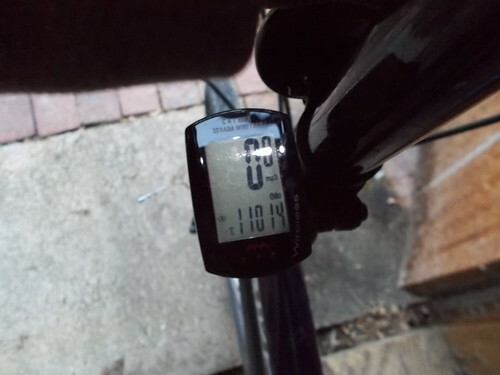 My longest ride of the year, 109.5 miles, was a jaunt in early July aboard Big Nellie from my home in Mount Vernon Virginia to Purcelville Virginia to get a hot dog at Haute Dogs and Fries. I did two other centuries during the year, The first was in early May when I rode The Mule 100.5 miles from the DC Washington Monument to the Baltimore Washington Monument. This was a particularly difficult ride because I had some kind of chest cold that made breathing really difficult. I missed riding a Populaire ride in the spring so I obtained the cue sheet and did it a short while later aboard Big Nellie. The ride was to and from home and Hyattstown Maryland (near Damascus if that helps) for a total of 107 miles. Most of my commutes were solo affairs, but I was joined now and then by Reba, Ed, Kirk, Kelly, and Nancy. Thanks for the company. Off the bike I dipped my toe into the bike advocacy waters. I attended a couple of public meetings and signed people up for memberships in the Washington Area Bicyclists Association (WABA). I lucked out and managed to pick the busiest spot and won first prize in the membership contest. Woo hoo. In addition to the centuries, I did a whole bunch of event rides. 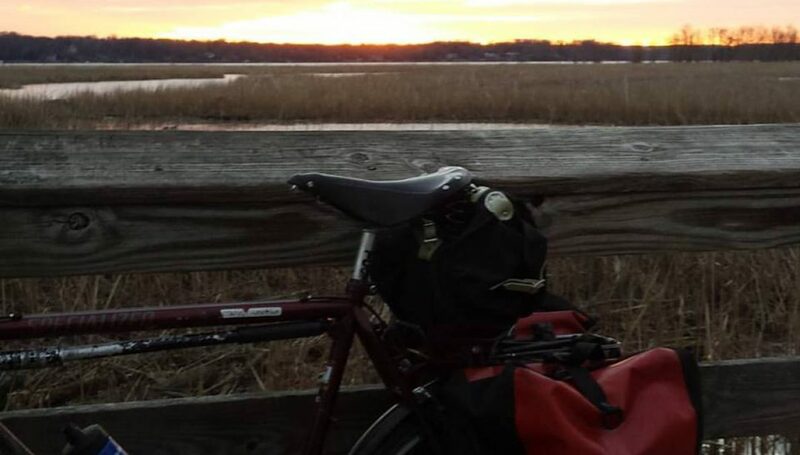 Fifty States, Backroads, Great Pumpkin, Bike to Work Day, Vasa, Cider Ride, and Southern Maryland. The best part of which was all the great people who rode with me or kept me fed and watered at the rest stops or entertained at Friday Coffee Club. So at the risk of leaving some people out, thanks to the original Friday Coffee Club (Ed and Mary, Brian, and Lisa), Mike and Lisa, Jacques and Hugo, Dave and Jean and Kid O, Jon and his girls, Alex and Chris (don’t leave us), Jeff, Justin, Ryan, Crafty John and Kate, Kristen (and family) and Elizabeth, Kirstin and Tom, Lawyer Mike, Not-lawyer Michael, Mikey, Pete, Dana, Darren, Tony, Kevin, Aaron, Kathy L., Bob (Don’t Call Me Rachel) Cannon, Rachel (Don’t Call Me Bob) Cannon and Kate and Katie Ann, Jeremy (Don’t Call Me, I’m Sleeping) Cannon, Chris N., State Certifried Chris, Chris and Katie, Kate and Kermit, Adam and Crystal (come back), Lauren (stay for a ride next time), Adam (you, too), Liz and the Mechanic, Ted and Jean, Pink Pete, Peter, Lane, Ricky, Lolly, Greg and Nelle, Megan and Katie, and Charmaine (and Nancy on a bike!). Since this year went so well without goals, I’m doing the same for 2014. Sounds like a plan. Those of us to lived near the site spent ten years of our lives dealing with the delays and headaches associated with the replacement of the Woodrow Wilson Bridge. For those of you who don’t live in Washington, the Wilson Bridge carries I-95, the main north-south interstate on the east coast, across the Potomac river. It is also part of the famous Washington Beltway. The old bridge was built in the early 1960s and was literally falling apart. You could see holes in the concrete decking, erosion of the support pillars, and rust on the steel structure. The new bridge is about twice as wide and is visually quite appealing. And as a bonus it has a multi-use path on its north side affording views of Alexandria city and DC. The path isn’t perfect (expansion joins make for a jarring ride) but it is a terrific addition to the bicycle route network in the area. There is one problem with the path: it doesn’t connect to much on the Maryland side. You ride across the river, take a switchback to a deck over the highway, spin down a spiral descent on the south side of the road and follow a long curving path to and dirt path paved in a manner of speaking with shells. FAIL. You can ride this sketchy path directly to National Harbor which looks for all the world like Sodom on the Potomac. It is a development dominated by a massive hotel and convention center with a faux village at its glass and brick feet. The village has many of the usual cookie cutter eateries and shops that I do my level best to ignore. The development also has the statue of the Awakening, Prometheus emerging from the ground. For many years it made the desolation of Hains Point in DC a destination for tourists. Now it is crammed into a narrow riverfront looking for all the world like it was dropped there by a passing aircraft. National Harbor is growing. Massive townhouses are sprouting from the hill above this off little downtown. It is all fenced in, to set it apart from the run of the mill adjacent suburb known as Oxon Hill. If you want to ride to Oxon Hill, you take a left at start of the shell path, pass through a tunnel made from a corregated steel tube and climb a long steady half-mile hill to Oxon Hill Road.. OHR is not much to write home about but, for the last few months, it has been torn up by construction. About 1/2 mile of the road is now open for use. It features bike lanes on either side. I decided to check the new road out yesterday. The completed section of road leads to a new outlet mall that attracts an appalling amount of car traffic. Cars are parked all over the place and herds of shoppers need assistance from a dozen police and rent a cops at the intersections. Lovely. As for OHR, it leads to Fort Washington and other sites rarely explored by most DC-area bicyclists. To really enjoy checking out this area, cyclists are going to have to wait a while. As I found out yesterday, road construction continues past the outlet mall for at least a half mile. I gave up when I had to cede the narrow road to fire trucks and police cars. From the looks of things (sorry no pictures, I was busy trying to stay alive) the renovated OHR will be a pretty nice ride. For now, you should probably avoid the area. Unless you’re in the market for cheap clothes. Dr. Howard, Dr. Fine, Dr, Howard, a photo by Rootchopper on Flickr. Truth be told, in the short tradition of Friday Coffee Club, we had an hour of great conversation. The highlight was Mike describing how, when his laptop battery died many years ago, he boxed up his desktop computer and took it on a business trip with his boss. We held down the fort for our friends who have loved ones and interesting lives and really warm places to be. After about an hour, we rode our separate ways. And so the four of us closed out Friday Coffee Club for 2013. I know I speak for the three others in attendance when I say that we look forward to many more get togethers in the new year. 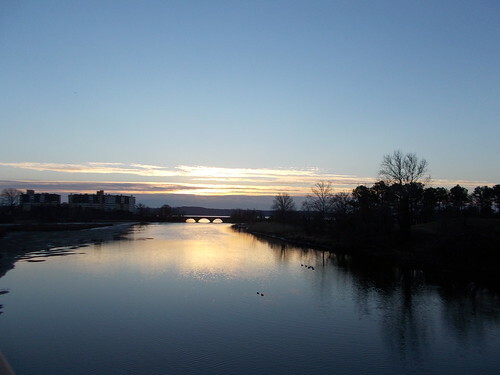 Christmas Eve Sunrise over Hunting Creek, a photo by Rootchopper on Flickr. I took an unusual route to work today. Not a bit of my ride in was on the Mount Vernon Trail. I was still treated to a pretty darn nice sunrise as I made my way from US 1 to Washington Street. The ride in was uneventful but for a red light runner who almost hit me in Old Town. I rode past Arlington Cemetery. Each tombstone had a Christmas wreath leaning against it. We were let out of work early so my early Christmas present was a ride home in the daylight, with a nice tail wind to boot. Big Nellie and Me, a photo by Rootchopper on Flickr. I found out that I need to take Monday off from work. Normally, I’d just email my boss and do the paperwork later, but this might be a problem since the admin staff is short this week. As it turns out it was 70 degrees outside on the winter solstice so I couldn’t pass up the chance to do a bike commute on the weekend. 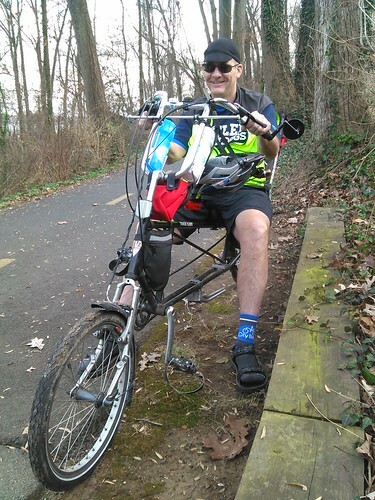 Big Nellie and i enjoyed a steady tailwind all the way to Rosslyn. This meant that the ride home would be a struggle. And it was. A little over 2 miles from home I was passed by Charmaine going the other way on the Mount Vernon Trail. We used to ride together all the time until she moved a few years ago. We stopped and chatted for a good 1/2 hour. Then she took this picture of Big Nellie and me and we rode off in opposite directions, racing the fast approaching dusk. Was Hitchcock Canadian?, a photo by Rootchopper on Flickr. When I left the house just before sunrise it was 28 degrees. It warmed, in a manner of speaking, to 35 by the time I made it to work. I left work at 2:30. It was 62 degrees. It felt like heaven. Apparently, the Canada geese agreed. There were several hundred of them grazing in the grass along the Mount Vernon Trail just down river from the Memorial Bridge. There was not a single goose in the water. This picture captures about half of them. 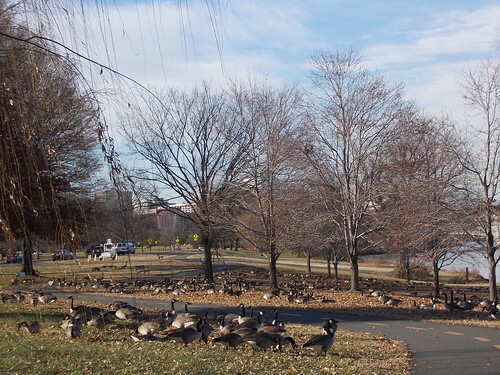 I defy anyone to ride through this many geese without saying “Honk’ at least once. 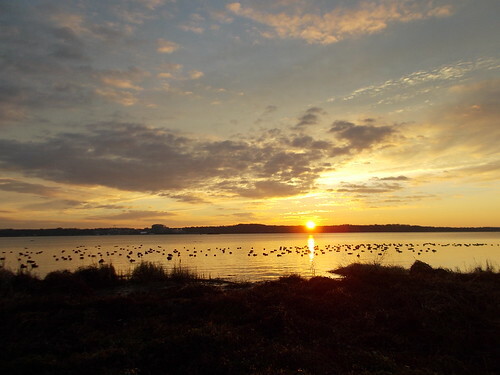 Sunrise Potomac River 12/18/2013, a photo by Rootchopper on Flickr. It’s nearly the solstice. The sunrises are downriver from my route to work. I stop and look over my shoulder. After a mile of riding, the sun peeks over the horizon and I stop to appreciate it. It may be cold and the trail may be icy, but the sunrise makes the ride to work worthwhile. Less than a minute after taking this picture I spotted a bald eagle in the Belle Haven tree. He was checking out the sunrise too. Little Nellie Turns 11, a photo by Rootchopper on Flickr. During my 170th bike commute of 2013, Little Nellie, my Bike Friday New World Tourist, passed 11,000 miles. I think I’ll give her the rest of the year off. 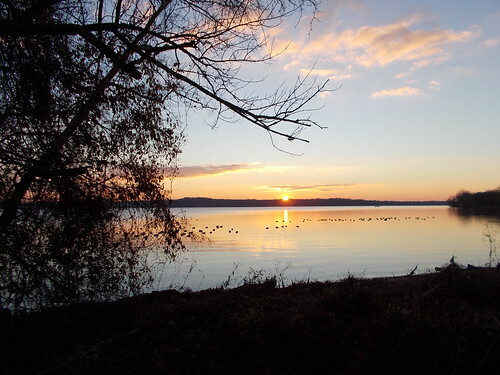 Potomac River Sunrise 12/16/2013, a photo by Rootchopper on Flickr. My first bike commute in a week was a cold affair. The trail was ice free though and Little Nellie and I made slow progress into a headwind. Then I caught the sunrise over my right shoulder and had to stop to take a picture. Never. Gets. Old. At night, about a half mile from home, two eyes illuminated by my headlight peaked at me from beneath a guard rail. It was a mature fox. He didn’t say anything, just turned and ran into the woods. It rained. It sleeted. It snowed. True to its policy, the National Park Service refused to sand, salt or plow the Mount Vernon Trail, leaving all of its bridges an icy mess for the week. I fell on icy roads last winter and noticed that it was painful, so I decided to forgo orthopedic chaos this week and either drove to work or worked from home. I haven’t looked at my records but this may be my first weeklong shutout since Snowmaggedon. The week wasn’t a complete loss. Since I had my car at work, I drove up to the fabulous WABA World Headquarters to pick up my prize for winning their membership drive. During the drive, I chose to sign people up for WABA memberships on the Mount Vernon Trail at the 14th Street bridge. It was my good fortune to pick the spot that several hundred bike commuters passed that evening. My prize was a Chrome bike messenger bag filled with bicycling goodies: socks, a U-lock, a water bottle and cage, a refrigerator magnet, EPO, and a jersey. (Just kidding about the EPO.) II was really kind of excited about the jersey. I don’t own a single bicycle jersey. The one I won is a large. I suspected that it was probably a little small for me. So I tried it on. Apparently, they acquired this jersey from.the new City Bikes store in Lilliput. I looked like Will Ferrell in the cowbell sketch. I’m sure I can find some svelte person to give it to. On Thursday night I drove to the WABA holiday party at the Bier Baron, which is located in the west end of DC, between Dupont Circle and Georgetown. Car traffic was gridlocked so after 15 frustrating minutes I kind of gave up on the party and turned toward Georgetown. Within a block I found free on-street parking. It was sign from God that I should not give up. I parked my car and walked a mile to the venue in the cold. Inside there were a flabbergasting number of WABA people, so many that it was impossible to get a drink. I followed Alex and Chris to the basement bar. We hung out with other thirsty refugees including Dave, Brian, Chris B, and Lolly. The beer was pretty good except for a habanero laced pint that fearless Lolly ordered. It was muy picante. I sipped it and my mouth burned for 20 minutes. I can’t comprehend how anyone could ingest more than an ounce or two of the stuff. After a while Chris B and I went back upstairs to mingle. I said hello to Megan and Colin along the way. We hung out with Katie (I’m pretty sure there’s a Kate Bicycle Cult in this town) and her sister Liz. The hour was getting late-ish so I bid my farewells and braved the frigid temps to walk back to my car. Beer is good antifreeze. It felt great to walk with my jacket open. Take that winter!